[gallery ids="1535,1536,1537,1538,1539,1540,1541"] BEST PLAY! My play THREE PEES won the People's Choice/Best Play Award at the 2015 Maine Playwrights Festival/24 Hour Theater Project on May 17, 2015. Written as a riff on playwriting festivals, three characters in a play help the playwright redirect his play with “their” suggestions. The rehearsal pictures show how much fun the actors were having with the piece. The video will have you laughing with each line. THREE PEES makes fun of everything including the playwright (me). You can order on my website a reading copy or production copy with performing rights. If you can imagine a short play with Tom Brady and North Korea in it, you are imagining THREE PEES. My two ten-minute plays MARKET DAY and SOMETHING BLUE received staged readings at the Snowlion Rep Co play lab last night in Portland, Maine. MARKET DAY depicts the human trafficking of captured girl age 12 in the middle east. SOMETHING BLUE depicts a young woman in Gaza, engaged to a man in the West Bank, who has not able to be united with her fiance for three years. One of my most satisfying moments during the evening was when one of the actors remarked that though the plays were set in very specific locations, they concerned universal issues and could have taken play anywhere. The women in the audience were particularly shocked at the treatment of the woman in MARKET DAY by male traders in an ISIS-held area. All in the audience sympathized with the woman in SOMETHING BLUE who could not be united with her loved one because three governments (Gaza, Israel, and the West Bank) do not consider marriage as a “humanitarian” issue. The woman is left with ironing her wedding gown daily—keeping it ready for her marriage “some day.” Both plays are available for Reading and Production on my website. Let me update you on what is going on in Maine: Maine Restaurant Week ran the first two weeks of March. The Snowlion Repertory Company was commissioned to produce an evening of short plays. The only stipulation to the 12 playwrights was that each play would be about food. What a feast! There were 6 sold-out performances of this very entertaining program the first week of March in Portland. My play was "Nyaring." The Crowbait Club meets every first Wednesday of the month. A theme is picked and playwrights bring 10 minute plays to the meeting. A cast is picked from the audience. Two minutes is given to each playwright to "direct" the play, and the play is given a staged reading. The best play of each month is selected for the yearly "King of Crows" production during which each play is fully produced. The theme for May is "Death." Hoping my play "Scattered Ashes" will be picked. The Maine Playwrights Festival (produced by Acorn Theater) is occurring in May. Selected plays will have a full production. At the end of the weekend, the "24 Hour Theater Project" happens. Playwrights are provided with a sentence of dialogue, a prop, and a location, and write a play over night Saturday. The casts have all day Sunday to rehearse. The plays are put on Sunday evening. What fun! I'll be one of the playwrights. The Snowlion Repertory Company has a monthly playlab. Selected play have a staged reading followed by a discussion of the plays by the other playwrights, cast, and directors in the playlab. In May my one-act plays "Market Day" and "Something Blue" will be staged. Here is a recent column in the Portland Press Herald titled "God is revealed to those who seek Him.". An excerpt from the column: "When Hannah left my office that fateful day, it was as sunny as when she entered it. “It should’ve been raining,” she lamented at her next appointment. “But there wasn’t even one cloud in the sky!” Hannah felt a gentle summer breeze as she reached her car. It infuriated her. “There should’ve been a hurricane for what I’m gonna go through!” People in the parking lot walked by Hannah without acknowledging her. “No one was crying. No one was even looking at me,” Hannah sighed. “It was like nothing had happened.” Hannah continued, “I was told I had cancer! I was scared. I was alone. Why didn’t anyone in the world know what was happening to me?”" Click this link to read the rest. Remember returning to school in the fall during elementary and junior high school and having to write an essay about what you did on summer vacation? Perhaps it was going to the beach or to a lake. Maybe it was riding your bike with friends. Or sitting outside after dinner and having a campfire in your own backyard. How about a family trip to the country your family came from and learning about the customs of your family when when they lived in Europe, Africa, or Asia? That's what the main character, Mariam, would have to do if she went on her family trip in my play WHAT'D YOU DO ON SUMMER VACATION? But before she left on her family trip to Somalia, Mariam discovered what her mother and father expected her to undergo in a small hut outside her relative's village in Africa. 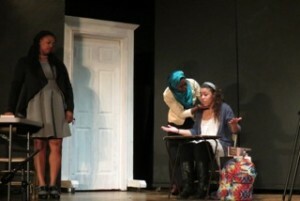 The subject of my play is the story of Mariam facing the threat of “vacation cutting.” WHAT'D YOU DO ON SUMMER VACATION? had two performances on April 18, 2015 in N.Y. at the Northport One-Act Play Festival. The play was very well received. A number of audience members approached me after the performances and asked what happened to Mariam after the play was over. Should I have told them? This is a play you should perform at your church, local theater, or college/high school. So-called female circumcision is an explosive topic that cannot be ignored. It is a procedure, condemned by the U.N., affecting millions of girls around the world each year. THE PLAYS TUNG SING by Harlan Baker Adventure is on the menu at one young man's favorite Chinese restaurant. SERVED HOT by Brent Askari A desperate restauranteur cooks for a customer who possesses a dark secret. THE CLARITY OF PIZZA by Carolyn Gage A lesbian and her hetero best friend fight over a guy and discover a slice of liberation. FAST CASUAL by David Sussman A young man and his girlfriend's roommate discover shared beliefs - and dangerous feelings - over lunch. PASTA AND POETRY by Ann Tracy A TV cooking show pits a lady cabdriver against her gun-toting brother-in-law in an epic food fight. ASSORTED GREENS by Margaret Nomentana Art gallery visitors find food for thought. MY HARVEST TABLE by Laura Emack In their first shared summer, a new bride and her teen stepson face off amidst anthropomorphic vegetables. SWEDISH MEATBALLS by MK Wolfe Swedish Christmas traditions are in jeopardy when Anika brings home a shocking surprise to mom. MADELEINES by Bess Welden Mother's favorite Passover recipe changes everything Debra thought she knew about her family. HUNGRY LIKE A by Callie Kimball Bob and Janathia conspire to buck the system at a bizarre addiction treatment center. NYARING by Delvyn C. Case Jr. Two African children seek comfort and a good meal as rebels hunt them down. THE AMAZING DR. JONES book/lyrics by Mark Shaughnessy, music by Nathan Burcalow In a far-flung laboratory, two scientists musically mine the molecular origins of food. 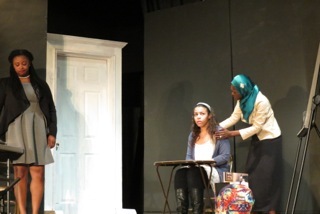 The 6th Annual 2015 Northport One-Act Play Festival will feature 14 new plays over the weekend of April 18th-19th. All plays will be performed twice, once as a matinee and once in the evening.  Actors and directors from all over Long Island will participate. Additional details can be found at www.NorthportPlays.com. PROGRAM 1: Sat, April 18th, 3:00pm and 7:30pm "The Wedding" by Arnold Kane, Directed by Alex Edwards-Bourdrez, with Rob Nassir and Melissa Kempton. "The Dunes" by Mike McKenna, Directed by Alex Edwards-Bourdrez, with Mike McKenna and Stephanie Sultana. "The Phenix Retirement Home" by Ann Fox, Directed by Liz DeFazio-Rodriguez, with Bobbie Ruth, Annette Kirk, and Ron Sabo. "What'd You Do on Summer Vacation?" by Delvyn Case, Jr, Directed by Rich Jimenez, with Farrah Tassy, Vanessa Arthur, and Savannah Beckford. "I Was Named By My Mother" by Michael West, Directed by Michael West and Jo Ann Katz, with Frances Rosato, Michael Raimo, Larry Maltin, Mike McKenna, and Jackie West. "Dueling Monologues" Written, Directed and Performed by Charles Calabrese & Marion Gayer. "The Mean Old Man" Written and Directed by Rob Previto, with Liam McDonald, Jim Bradley, and Doreen Firestone. PROGRAM 2: Sun, April 19th, 3:00pm and 7:30pm "Denny, Lenny and Rose" Written and Directed by Patrick Sherrard, with Teresa Bolz, Michael Mingoia and Chris Baker. "The Kempinski Surprise" Written and Directed by SJ Richardson, with Gina Haver, Rich Jimenez, and Lara Hunter. "Addiction" by John Passadino, Directed by Maria Capp, with Jose Ramos. "A Show Dog's Tale" Written and Directed by Nancie Xirinachs, with Alex Edwards-Bourdrez, Clare Lowell, Nancie Keegan, Kalene Speranza, Mike McKenna, and Nancie Xirinachs. "Tea Leaves" by Brian J Murphy, Directed by Rob Previto, with Stephanie Sultana and Keith McHugh "Dry Eyes" Written and Directed by Paul Rawlings, with Chris Baker and Tammy Baiko "A Real Step Up" by Geoffrey Craig, Directed by Stan Katz, with Sheilah Barksdale, Gina Haver, and Scott McIntyre. What does your church do after communion on Maundy Thursday? 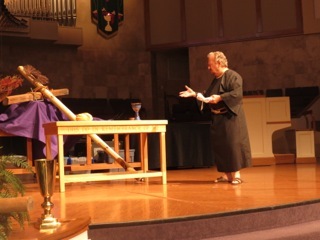 Before the service is over, consider performing my play ONE MAN, ONE TABLE that depicts Judas returning to the Upper Room after Jesus and the other disciples have left for Gethsemane. What does Judas find? Everything has been neatly put away in the room where the Last Supper took place except for several pieces of bread and an empty cup. Did Judas miss something? What is the significance of the bread and the cup that was left? Did something new happen that had not previously been part of the Passover meal? All these issues Judas ponders. What does Judas conclude? What does Judas leave to do after considering all he has seen that night as well as during his three years with Jesus? ONE MAN, ONE TABLE was performed at First Presbyterian Church in Bonita Springs, Florida this Maundy Thursday and at First Baptist Church, Portland, Maine several years ago. For the play there were 500 in attendance (Florida). ONE MAN, ONE TABLE makes a powerful statement about the events of Holy Week and will enrich your Maundy Thursday church service. What is the significance of the shamrock in Christian history? How did Saint Patrick use the shamrock to teach an important aspect of God? Why did Saint Patrick go to Ireland the first time? Why did Patrick go to Ireland the second time? SAINT PATRICK 440 A.D.: MISSIONARY TO IRELAND was produced at First Presbyterian Church, Bonita Springs, Florida on Sunday March 15, 2015. Through my play (and the pastor's message), the audience/congregation watches and learns about early Christian history and the Christian basis of Saint Patrick's Day. March 17 is not about green beer! It's about the way of ruling a nation: vengeance or grace. It's a theme applicable to the days of Saint Patrick AND today. It's also about missions during days to Saint Patrick AND today. 3000 people were in attendance for the production in Florida! [gallery size="medium" link="file" ids="1466,1467,1468"] Celebrate Saint Patrick's Day with SAINT PATRICK 440 A.D.: MISSIONARY TO IRELAND in your church next year! [gallery link="file" ids="1453,1454,1455"] NYARING added “dramatic gravitas” according to The Portland Phoenix, March 4, 2015 to The Maine Dish, 12 plays about food produced by Snowlion Repertory Company, staged during Maine Restaurant Week March 1­14, 2015. My play NYARING concerns two South Sudanese siblings running (“nyaring”) to be reunited with their parents. During the play, the two children eat grass—all they can find to eat. The play begins with the sound of AK­47s as the children enter, and ends with AK­47s as the children exit. For the children it is a life ­and­ death situation as they flee the devastation of civil war and hope to find shelter at a U.N. refugee camp. NYARING was very well received not only for its dramatization of particular cruel events but for its universal themes of civil war, fear, starvation, separation of families, and impact upon children. Nyaring ran for six SOLD OUT performances. To view the Portland Phoenix article for Maine Restaurant Week, click here. It is impossible not to consider whether there is meaning to our existence when a vibrant life ends. (originally printed in the Portland Press Herald, February 21, 2015) It is difficult to discern a meaning of life with all the seemingly insoluble problems of the world. Especially vexing is to find meaning when a family member dies in the prime of life. As I added the chart of John, who died at age 40, to those of my patients who have died over the years, it was impossible not to consider whether there is meaning to our existence when a vibrant life ends with struggle and agony, a seeming defeat of all love and hope. I have attended a number of my patients’ funerals, and they have given me an encouraging perspective for coping with loss and the meaning of people’s lives. As I entered church for the service, there was a table of photos representing John’s life. First there were baby pictures along with a family photo at his christening, followed by him in elementary and high school. There were photos of John in his black cap and gown during his high school graduation. Later, John is seen standing in front of the company he founded in Maine. There were wedding pictures and snapshots with his wife and sons during vacations. The last picture was John sitting in a wheelchair, gaunt from the ravages of his illness and bald from chemotherapy. Alongside him were his wife and children, also bald, visible testimony of the love John’s family wanted to demonstrate during his illness. Standing at the end of the table of photos, I pondered: Is this all there is? In the sanctuary, I found John’s grieving wife and children sitting with his brother and sister, numerous nieces and nephews, and his parents. At the beginning of the service, many in the congregation had tears in their eyes as family members recounted John’s life. The minister told John’s family that grieving was appropriate and proper, but then read the 23rd Psalm. Written three millenia ago by King David during a time of travail in his own life, the psalm sings: “The Lord Is my shepherd, I shall not want” (v. 1) and ends triumphantly “And I will dwell in the house of the Lord forever” (v. 6). The next reading was from the Book of Job, the quintessential book of suffering. Job, after the loss of his children, his possessions and his health, was still able to shout: “I know that my Redeemer lives, and that in the end he will stand upon the earth. And after my skin has been destroyed, yet in my flesh I will see God; I myself will see him with my own eyes – I, and not another. How my heart yearns within me!” (Job 19: 25-27). Finally, there were the comforting words of Jesus: “Do not let your hearts be troubled. Trust in God (the Father), trust also in me. In my Father’s house are many rooms; if it were not so, I would have told you. I am going there to prepare a place for you. And if I go and prepare a place for you, I will come back and take you to be with me that you also may be where I am” (John 14: 1-3). From Genesis to Revelation, the pastor remarked, there were many other passages that reveal that God is in control, that He will make all things right in this broken world at the end of time, and there will be a happy ending for those who love God. The service ended with the hymn “Joyful, Joyful, We Adore Thee,” a rapt acclamation of the future. As the funeral service closed, there were still tears for a husband and father who was loved and would be deeply missed. However, there was also the confidence that John’s life had meaning despite his suffering and early death, and that we would be with him again. I am continually challenged to make sense of patients’ struggles, which I witness regularly along with deaths that are too often untimely. If I want to be encouraged how all will turn out for John and others for whom “The Lord is my shepherd,” I go to a funeral. It's not too early to plan for Valentine's weekend in 2016 at your church! 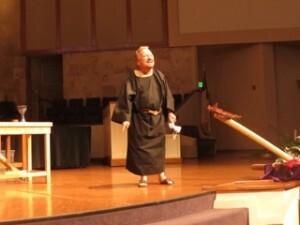 My play VALENTINE'S DAY, 269 A.D.—THE END OF THE BEGINNING was produced at First Presbyterian Church in Bonita Springs, Florida on Valentine's weekend this year. The play provided the pastor the opportunity to preach on the Christian history of the holiday, its meaning today, and the various forms of love. At the end of the play, little children approached the stage and handed Valentine (in prison) small pieces of papers with Christian symbols on them. For Valentine these messages provided great comfort as he awaited his fate. I also had similar pieces of papers given to each of the congregation as they arrived at the church. These messages to Valentine in the third century were the original Valentine cards! 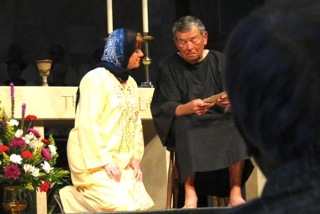 This play was performed at First Presbyterian Church in Bonita Springs, FL to an audience of over 3000. Want the play for your church or school? Click here for an easy download. Elvis is on tour! After being in my play THE KING OF ALL KINGS in Portland, Maine in the fall, Elvin is appearing at the First Presbyterian Church in Bonita Springs, Florida on February 7 and 14—probably to escape the snow and cold of winter in Maine! THE KING OF ALL KINGS will be performed at the Great Banquet—a retreat for men and women scheduled for two consecutive weekends at the church. Since I am playing the part of Elvis in this production, I tried on the costume at home. My wife said I looked ridiculous! Did she mean Elvis looked ridiculous, or that I looked ridiculous in the costume? By 1974 when this 5 minute play takes place, Elvis did look pretty bad. The excesses of his life-style were taking a big toll on his appearance. Despite being a Christian, he was struggling with his walk with God. This is why THE KING OF ALL KINGS is relevant. We can all stumble. We all need to be continuously focused on the Lord. It is far too easy for any of us to step away with the temptations of daily life. There is too much GOOD out there to consume us. Or is it always GOOD? And then there are the consequences. THE KING OF ALL KINGS will make for a timely sermon about Christian living by your pastor at a church service or lively discussion for a leader at a retreat or small group. THE KING OF ALL KINGS is available for purchase and production. Three of my plays VALENTINE'S DAY, 269 A.D.--THE END OF THE BEGINNING, SAINT PATRICK 440 A.D.: MISSIONARY TO IRELAND, and ONE MAN, ONE TABLE will be produced at the First Presbyterian Church in Bonita Springs, Florida during the next three months in the Winter and Spring of 2015. Each will be performed during church services. The Valentine play dramatizes the last day in the life of Valentine who was martyred for his faith in Rome in the Third Century. It is a play that portrays the Christian basis and origin for the holiday. The Saint Patrick plays dramatizes how Patrick taught Christian doctrine to the pagan people of early Ireland. ONE MAN, ONE TABLE is a play about Judas who returns to the site of the Last Supper and ponders the meaning of the bread and cup left after Jesus and the other disciples made their way to Gethsemane. Each play has a running time of 5 minutes and would fit easily into a church service, visually depicting early Church history and doctrine. Each is available on my website for your reading or production. What if you regret creating an invention used by millions around the world? How if that invention has caused millions of deaths around the world? This is the angst Makhail Kalashnikov felt as he faced death reading in the newspaper how he would be remembered. Kalashnikov was not alone in regretting his discovery. Albert Einstein and Alfred Nobel also lamented that their inventions/discoveries had caused great human misery and suffering. This subject of regret over one's actions is the basis of my short play THE CONFESSION OF MAKHAIL KALASHNIKOV. THE CONFESSION OF MAKHAIL KALASHNIKOV is now my featured play and can be downloaded for free. This thought­ provoking example of feeling responsible for one's actions would segue intoa great sermon or group discussion on moral responsibility. None of us might discover or invent the AK­47, the atom, or dynamite, but we all are responsible for what we do—everyday. THE CONFESSION OF MAKHAIL KALASHNIKOV has a running time of 5 minutes. There are only two characters. The staging and costuming are both simple. High stakes abound in my play BABU, NO BABUJI read at the Northport Reader's Theater on December 8, 2014: A young Indian girl is locked in the dark in her grandfather's house, bound to a chair with a cobra loose on the floor. This tense, dramatic situation cannot be resolved until the girl agrees to become a prostitute! What if becoming a prostitute saves the family from starvation? BABU, NO BABUJI has just 2 characters (3 if you count the snake) but contains enough action to enthrall your church or theater. What should the girl do? What should the grandfather do? What should the snake do? BABU, NO BABUJI was beautifully read at the Northport Reader's Theater, and the conversation that followed related to the stakes each character had in the outcome of the play. Even if our decisions aren't complicated by a snake in the room, we can relate to the characters in BABU, NO BABUJI by considering the threatening (even life-threatening) circumstances in our own lives. A story of a survivor of the Rwandan genocide traveling to another village to seek revenge for the murder of his family is the theme of my play UNFORGIVEN that was read at the Northport Reader's Theater on December 8, 2014. Though my play deals with a particular dramatic situation in a particular time and at a particular place, the idea of seeking revenge is a universal human conundrum. My play was expertly read by New York actors, and the drama of the scene could be immediately felt at the top of the play. The discussion that followed revolved around not only specific issues of the play but the general concept of revenge and forgiveness on the other side of the world as well as in the United States. Revenge and forgiveness are topics fit for dramatization and discussion in a variety of settings. UNFORGIVEN is appropriate for theater and school settings as well as for churches. A reading of the play would also work for small groups wanting to explore these most explosive topics. There is a new article that I have written in the Reflections section of the Portland Press Herald. In the Lifestyle section of the Press Herald, Reflections is written by members of the faith community on different issues. The columns I write comment on the integration of medicine and faith. The Reflections columns I have written have garnered national attention and awards, and have been featured in several other online outlets including WORLD magazine and the Amy Foundation. Both Marilyn and Mary in the Bible risked their lives to achieve what was important to them. Written as a Christmas piece, it holds meaning throughout the year for as a parable for those dealing with sacrifice. To read the entire column, click here. ELVIS PRESLEY LIVE IN PORTLAND, MAINE NOVEMBER 2014! Imagine a pretty announcer in a long gown approaching the microphone and shouting out the nominees for one of the 1974 Grammy Awards. She encourages the audience to respond to each name. The last nominee is Elvis and the audience goes wild! This is what happened at the Crowbait Club in Portland the first Wednesday of November. As Elvis, dressed flamboyantly and working the audience, steps to the microphone and receives his award, “How Great Thou Art” for which he won the Grammy is played as at the awards ceremony. Elvis then recounts his testimony and walk with God. Elvis can be LIVE at your church as well in my fully revised 2014 version of THE KING OF ALL KINGS. Hear Elvis recall in his acceptance speech his stumbling as he tries to walk the Christian walk and what turned him back to God. Then let the audience (the congregation) ponder their own walk and how we must turn back over and over again! I missed Elvis coming to Portland—he died a few days before his scheduled show in Portland decades ago. But YOU don't have to miss him. Order THE KING OF ALL KINGS for your church and learn from Elvis about the Christian walk! By the way I still have my tickets for Elvis' performance from 1977! It was the day I was waiting for. Six months ago I initiated the planning of a Drama Ministry at First Presbyterian Church in Bonita Springs, Florida. In mid September 2014 I went to Florida for casting and was pleased by the wonderful turn-out of people interested in acting as well as technical areas. We rehearsed on Thursday and Friday with a Dress Rehearsal on Saturday. On October 26 we had our first production to an audience of over 1200 at the church service. MARTIN LUTHER AT THE DIET OF WORMS: DAY OF DECISION was a success! For an 8-minute play the two rehearsals were sufficient. Usually for a 5-minute one rehearsal plus a Dress Rehearsal is satisfactory. I revised this play changing the role of a novice priest interested in hearing both sides of the controversy to a nun working in the Cardinal's office. This gave the production additional levels of interest by dealing with what much a woman should be or could be interested in deep theological matters in 1521, and how she might react to the cogent arguments of the reformer. The audience really appreciated the role of Justine in the production. With “A Mighty Fortress Is Our God” song by the congregation and the sermon directed toward Martin Luther and “ justification by faith,” the play contributed to a service that fully engaged the congregation in experiencing the critical early days of the Reformation. MARTIN LUTHER AT THE DIET OF WORMS: DAY OF DECISION is available for production at your church. Susan did not need her friends the first time her husband developed lymphoma. All he had was a lump in his neck without any symptoms. The testing went smoothly, the chemotherapy was well tolerated especially with the newly available anti-nausea medications, and he returned to work within weeks of completing treatments. With the excellent prognosis, Susan felt relieved and confident. The second time was different. Susan’s husband had fevers and weight loss, the testing was exhausting, the chemotherapy made him sick despite multiple anti-nausea medications, and returning to work was not even discussed. In addition, Susan had to cope with a very uncertain future for her husband. She needed the support of her friends, and told me in the office she looked forward to the visits of her two closest friends. They were both members of her church and she knew they would be expressing the love of God to her. At her husband’s next appointment, I asked Susan how the visits went with her friends. I was puzzled because both of her friends had so much in common with her. What made the difference? Susan said that one friend spent the entire visit talking, trying to figure out why Susan’s husband became sick and to encourage her that he would get better no matter what the doctors had said. Susan was exhausted when this friend left. Her other friend hardly said a word, let Susan vent about her husband’s illness, and held her hand while she cried. Susan felt great comfort with this friend’s visit. Susan’s experience with her friends made me reflect on the narrative in the Biblical book of Job, a personal experience that occurred more than 4,000 years ago. It is a book filled with profound yet practical lessons about pain and suffering. After losing all his children to a storm, all his possessions to marauders, and then his own health, Job is visited by close friends who “met together by agreement to go and sympathize with and comfort him” (Job 2:11). When they arrived, “they sat on the ground with him for seven days and seven nights. No one said a word to him because they saw how great his suffering was” (Job 2:13). Then they listened to a long lament from Job about his circumstances and condition. All went well until Job’s friends started talking. For 33 long, tedious chapters of the book of Job, his friends ranted about what they thought produced Job’s troubles. They accused him of gross sins that caused his illness. They said that by changing his ways and confessing his wrongdoings, he would be healed and his possessions restored. The reader knows from the first chapters of the book that none of the long-winded explanations his friends postulated had anything to do with the origin of Job’s miseries. What was Job’s opinion of his friend’s musings of his condition? “Miserable comforters are you all! Will your long-minded speeches never end? What ails you that you keep on talking?” (Job 16: 2-3). And to his friends’ speculation regarding Job’s future? “These men turn night into day; in the face of darkness they say, ‘Light is near.’ ” (Job 17: 12). So how are we to comfort others in distress using the ancient example of Job and today’s example of Susan? Interviews with those coping with a loved one’s distress have shown that both Job and Susan needed the presence of friends – showing up but not necessarily speaking up. Being there and doing what is practical are what the bereaving desire. Bringing over a casserole, taking out the garbage, washing a car, and taking the kids to school are helpful. Wan dissertations on the origin of pain and suffering are not. Continuing to visit is imperative. One’s presence is often needed long after family has left. Grieving can last months or years though we may think the individual should be over it. Do not be embarrassed to extend your caring; sorrow has no timetable. When it comes to tending those who are suffering, actions speak louder than words.